As home to the capitol building, the largest population, and the biggest university, Columbia is the center of politics, business, and education in South Carolina. But it’s not all business here. There is a playful soul in Columbia that might surprise first-time visitors. It’s a place where music fills the streets in the Five Points District. It’s a city brimming with funky coffee shops, passionate brewers, and hidden BBQ joints. And it’s a town that has held onto its love of outdoor spaces. To create an exhaustive list of everything that makes a visit to Columbia worth the short drive from Charlotte would be, well, exhausting. So here we suggest a sampler platter of the best outdoor and indoor experiences to fill your first 48 hour visit. It’s not a long drive from Charlotte to South Carolina’s capital city. So if you duck out of work a bit early, you can make it in plenty of time for dinner. But first, a quick stop at your hotel to check in and change into your eatin’ clothes. As one would expect in a town this size anchored by a large university, there are plenty of lodging options. From low dollar to high class, Columbia has an option for all budgets and tastes. The Inn at USC is a great option for its central location—adjacent to the university and within walking distance to the Five Points district, known for food, shopping, and entertainment. The moderately-priced rooms are a step above the average in both the cozy décor and spacious quarters. You’ll need your energy for a weekend of activity and in the south, that means barbeque. Richly smoked pulled pork is nearly a religion in these parts, and there’s no better place in Columbia to pay homage than Southern Belly BBQ. There are two locations in town, but for the real-deal, no-frills experience, visit their original space at 1332 Rosewood Drive. It’s nearly hidden location next to an overpass is a good indicator that you’re not in for a fancy night out. The options at Southern Belly are simply BBQ sandwiches and a bevy of creative sauces. There are no burgers, wings, gyros, "small plates" or, dare we say, salad. Your choice of sides include a bag of potato chips or no side at all. This menu is dedicated to the Q and it is fantastic. A smoky flavor permeates the densely pulled pork, which is tender and moist. The sandwiches may surprise BBQ purists with their creativity, but one bite of the Avita—a tangy vinegar sauce-covered creation paired with sweet grilled pineapple—will win over even the staunchest hearts. A small but ultra-local craft beer list accompanies the straightforward food menu. A great day of adventure begins with locally roasted coffee and house-made victuals. At least, it does at the Wired Goat. Tucked in behind the bustling shops and restaurants of Gervais Street, the Goat is everything a local coffee shop should be. As soon as you open the door to the large, industrial space, your head is filled with the mingled aromas of fresh ground coffee and just-from-the-oven bread. Loaves of various types line a shelf near the kitchen while trained baristas produce the creamiest cappuccinos known to man. The food menu offers all sorts of lunch and breakfast choices, and don’t forget to explore the downstairs space where funky furniture turns a cement-floored basement into an inviting retreat. After your morning pre-fuel, or maybe even before, get your exercise on the gently graded trail at Columbia’s Riverfront Park. Part museum, part outdoor gym, part natural escape, Riverfront Park is a great way to spend your morning. Anchoring the linear park is a 2.5 mile, tree-lined path that mirrors a scenic canal. After your bike ride or run and upper body circuit at the park, you’ll need some midday sustenance. The Hunter-Gatherer Brewery and Alehouse is just the place. The eclectic menu is full of high-grade pub grub including huge gyros, mac & cheese with a goldfish cracker crust, and fat burgers which, when covered in beer cheese, are sure to add balance to your morning workout. The Hunter-Gatherer is also Columbia’s oldest brewery and the attention to detail in each style is obvious. Columbia’s nickname is River City in reference to the confluence of three waterways here. There are plenty of places to paddle, but none with the incredible biodiversity of South Carolina’s only national park. 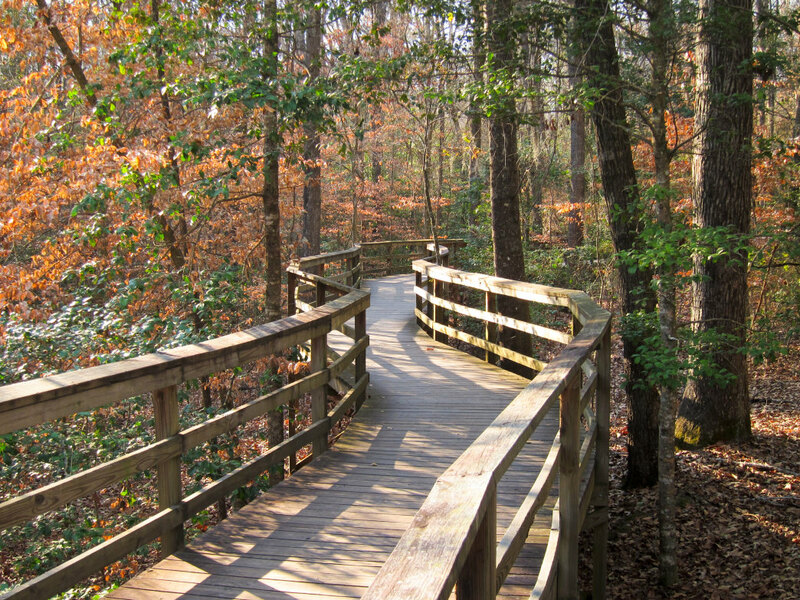 The nutrient dense, slow moving waters that flow through Congaree NP are home to the largest tract of bottomland forest in the country as well as a vibrant community of fauna. This is the place to turn off your phone, close your eyes, and listen to a symphony of crickets, song birds, frogs, and owls. The canoe trail on Cedar Creek is the easiest way complete a waterborne exploration of the park. Begin with a stop at the main ranger station and check with the rangers for current paddling conditions. While the paddle is not very technical, downed trees can create unexpected challenges. Once on the water, slow down and look up. Huge hardwood trees tower hundreds of feet above the creek while ancient bald cypress add character to the landscape. Once you’ve finished with the creek, head over to River Rat Brewery. The small brewery crafts an interesting collection of everyday beers as well as seasonally eclectic brews. If there’s ever been a place worthy of a flight sampler, this is it. Pair the sample with an order of expertly smoked chicken wings and you’ll be set. Make sure to get your sauce on the side—the wings are so good they’re worth a try au natural. It’s been a full day, but it’s time for one last rally. If you’re staying at the Inn at USC, then the Five Points district is a reasonable walk from your hotel. This lively area will be hopping by early evening. Restaurants and bars abound, so you have your pick. For a great beer selection, lively atmosphere, and delicious selection of savory tacos, drop into Publico Kitchen & Tap. Each taco is a mini work of art, mixing fresh ingredients and distinct flavors. The Carne Asada has a traditional mix of pico and beef on a puffy (fried) corn tortilla, and the cilantro lime shrimp version is a bold collection of powerful flavors including jalapeños and chipotle crema. After so much action, you may want to wind down a bit at the dark and delightfully moody Delaney’s Speakeasy. Wood accents and dim lighting frame a small stage that brings jazz favorites to Five Points. Settling into an oversized leather couch feels like you’re miles away from the hustle outside. Who needs sleep when there are trails to explore? Well, maybe a little sleep wouldn’t hurt. But then it’s off to the fast and flowy trails of Harbison State Forest. As the sun works its way through a forest of pine and your feet glide over needle-softened trails, you’ll soon forget about last night’s excess. With nine trails covering 30+ miles of trail and road, you’ll have plenty of options for a pleasant Sunday long run. The final stop before the drive home is Café Strudel for a well-deserved, hearty plate of steak and eggs or cinnamon pancakes. This place is super busy on Sunday, so give them a call from Harbison and put your name on a list in advance.